It can be tempting to put the extra bagels in the fridge – stop! These will cause them to dry out quickly. Instead, we recommend storing the bagels in a plastic bag at room temperature. Be sure to squeeze as much air out of the bag as possible. This method can store bagels for up to five days. But, be careful. Putting warm bagels in a plastic bag can cause them to be soggy. Nobody likes a soggy bagel. Another option is to freeze your bagels. This is a great option if you want to enjoy your Bag O’ Bagels at a slower pace, as they will keep for about 3-4 months in the freezer. To eat, simply pop the pre-sliced frozen bagel into the toaster – voila—you’ll have a quick, tasty breakfast. 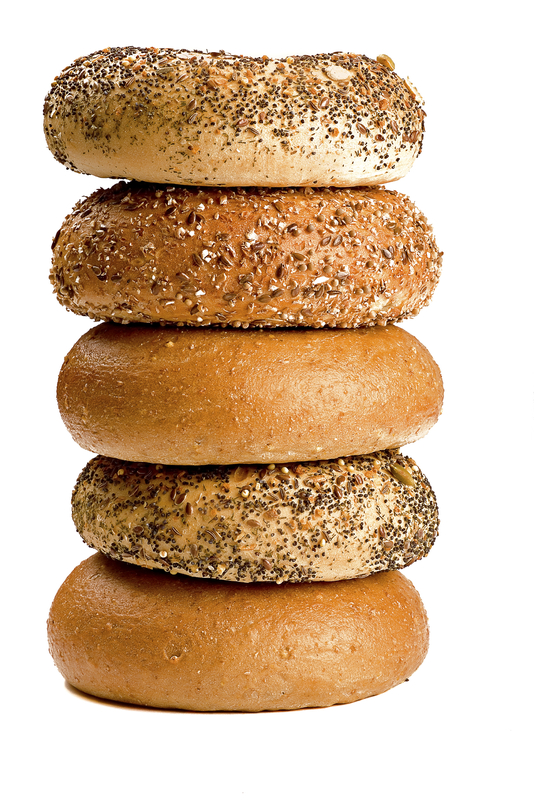 Don’t let the fear of stale bagels prevent you from buying our bagels in bulk. With these easy tips, you can have a fresh-tasting Bagel Bakery Bagel anytime. Your taste buds will thank you. We love bagels. And we bet you do, too. So, sink your teeth into these fun facts to learn even more about our favorite food. The earliest known mention of a bagel originates in Poland back in the early 1600s. However, it wasn’t until the 1960s until the bagel became popular in America. Due to its multi-step process, bagel production used to be a four-person job. In an assembly line, two men would shape the bagel dough, then a man boiled the bagels (the kettleman). Finally, the last man would be in charge of the oven. 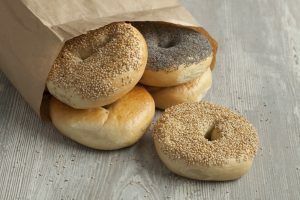 Americans sure do love bagels — nearly 61% of surveyed Americans reported to eat a bagel at least twice a week for their breakfast. 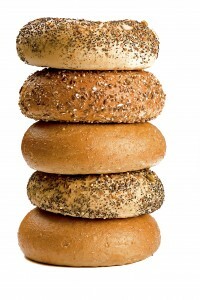 The most popular bagel flavor is plain, while sesame takes second place. National Bagel Day is celebrated on Feb. 9. But, we think every day is bagel day. Who needs an excuse to eat a bagel? Are we making you hungry yet? All this bagel talk is sure to work up an appetite. These facts are fun, but enjoying a delicious Bagel Bakery bagel is even better. Head over to our place and enjoy one of our beloved bagels. What about lunch at the Bagel Bakery? Many have heard the phrase “breakfast is the most important meal of the day.” Well, we think lunch is pretty important too – and a meal to be enjoyed at the Bagel Bakery. With our name, some may assume we offer just breakfast fare. However, we serve various tasty items for lunch. Come by during your next lunch break – you won’t be disappointed. Some may not know that we have fresh, tasty sandwiches and salads that are made-to-order every time. Choose from either one of our signature sandwiches, or build-your-own for both sandwiches and salads. Sandwiches can come on variety of breads, such as wraps, focaccia and, of course, bagels. Signature sandwiches range from the classic Caesar to the Cocky Curry Chicken wrap. If you want that same great taste, but without the carbs, turn it into a salad. There is bound to be a sandwich or salad to please every palate. Why is it that bagels get singled out as solely a breakfast food? Our bagel sandwiches can make a delicious, satisfying lunch. The Eggl Bagel with meat includes scrambled egg, cheese and your choice of sausage, turkey sausage, ham, bacon or smoked turkey. That’s a protein-packed lunch. Or, try one of our focaccia egg sandwiches, served on our freshly baked sundried tomato focaccia bread. The delicious Spinach n’ Sausage includes almost all the major food groups: carbs, protein, veggies and dairy. What are you waiting for? 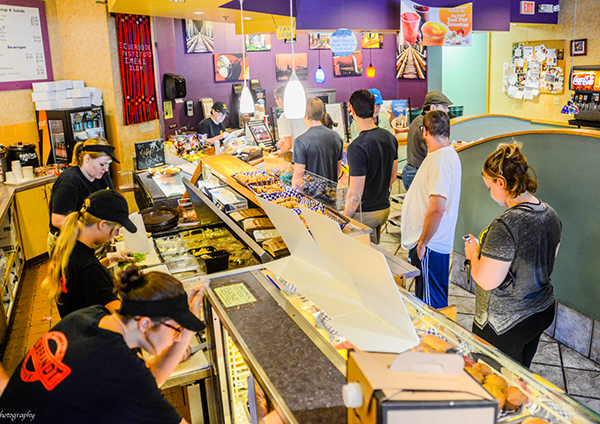 When your stomach starts rumbling at your next lunch break, choose the Bagel Bakery to fuel up. If you come for both breakfast and lunch, we won’t judge. There’s no such thing as too much Bagel Bakery. We look forward to seeing you.